Not many know that Brandy is deathly afraid of anything that reminds her in any way of Holland. No one in living memory has even been able to pin down the exact story, but we do know it has something to do with a clogging contest and an arrant windmill blade. If fact, whenever Brandy is asked to recount the event, she mumbles some thing about tulips and takes a hit from her hip flask. 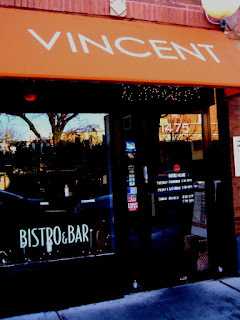 Perhaps this is the reason she was so wary of visiting Vincent, the so called "American bistro with a heavy Dutch accent," in Andersonville. 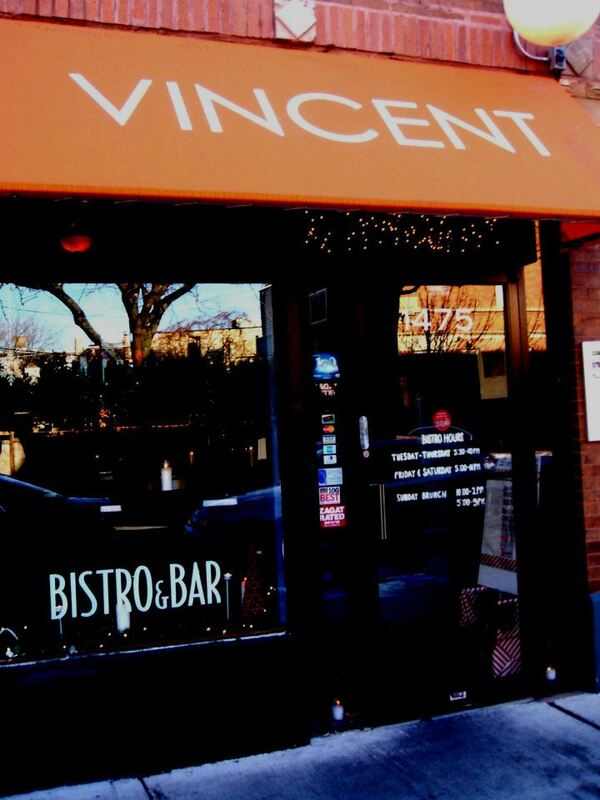 Biscuit Brown practically had to drag her there (Biscuit had heard tell of Vincent's famously decedent Bloody Marys), and once there had to deny Brandy's requests to blindfold her. The beautiful clean decor did ease Brandy's panic, especially when she saw the abundance of lit candles, which reflected off the various mirrors hung around the room, creating a stunningly warming effect. To settle her nerves, Brandy ordered a cocktail called The Getaway, a sort of bitter blood orange flavored punch. The bitterness did shine through at first, and then finished sweet, which Brandy rather enjoyed. Biscuit chose the Cheesemonger Bloody Mary, a traditional spicy tomato cocktail which came with what looked to be an entire cheese board, complete with stone ground mustard and pumpernickel bread (another possible option, Vincent's Bloody Ear, a Bloody Mary inspired by the restaurant's name sake Vincent Van Goegh, came with a fried pig's ear. "I refuse to eat anything I can buy in a pet store," Biscuit was heard to comment.) Biscuit loved the drink for its spices, but had some issues drinking the chunkier bits through her straw. 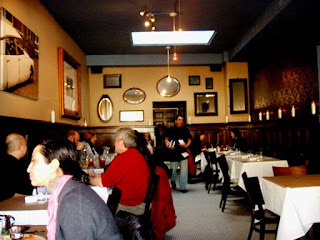 After Brandy stopped nervously eyeing a pair of decorative clogs in the corner, she ordered the Fried Oysters over Snert. Beautifully plated on a cutting board with a fresh hunk of bread and a sea salt dusted mound of butter, Brandy's fear began to subside as soon as she saw the dish. 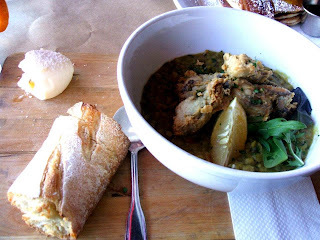 The snert, which Brandy soon figured out was a sort of porridge like split pea soup, was warm and comforting, with big chunks of bacon and carrots to break up the gentle taste of peas. The oysters could not have been cooked more perfectly; lightly crunchy on the outside, but supple, fluffy, and briny on the inside, they lent a perfect contrast to the soft snert. Brandy was left with so much butter after she had finished the dish (it was a VERY generous portion of butter) that she considered asking their lovely waitress to box it for her, so as not to waste it, of course. 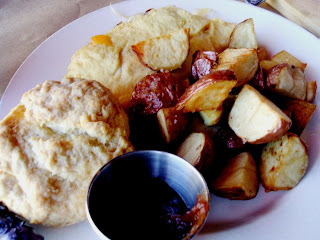 Biscuit chose a simpler dish, a Bacon, Cheddar, and Tart Apple omelet, which also came served with a fresh baked biscuit and house potatoes. The omelet was on the dense side, which Biscuit rather liked, and the mix of textures and flavors was spot on. The potatoes were soft and tasty, but Biscuit really loved the biscuit, which had just enough crunch on the outside, but was soft and moist inside. "I know biscuits, and this is most certainly a good one," Biscuit commented as she slathered more apple butter onto the baked treat. 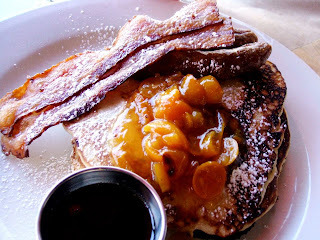 To finish up, Brandy and Biscuit split an order of pancakes, topped with brown sugar bacon, breakfast sausage, and kumquat jam. The bacon was heavenly; crispy and sweet to the point of almost being like candy. Brandy desperately wished for more than just the two pieces they'd been provided with. The sausage was nice as well, with a good snap on the casing and a lovely herbaceous quality to the meat. The pancakes were not the typical light as air confections most other places strive for, but rather of a more adult density, with nice toasty bits around the edges. The kumquat jam provided a lovely sour bitterness to the dish that ever so slightly tickled the taste buds. After such a filling and warm meal, Brandy's terror of the Dutch had all but disappeared. "If I had known a little bit of snert was all it took, I could have avoided a lot of awkwardness over the years," Brandy huffed as they left. Although most of the dishes were over $10, the amount of sides and the generous portions more than made up for the slight priciness. 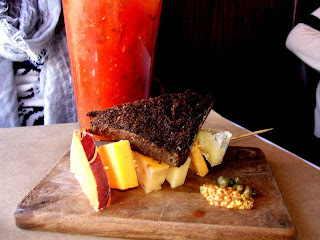 "Not to mention that $12 for a Bloody Mary may seem expensive until you see the cheese plate that comes with it!" Biscuit pointed out. With this lovely spot in mind, Brandy has now decided to spend her Christmas at the International Clogging Championship in Holland and she wished us to wish all of you a very Merry Christmas and the happiest of Holidays!